On Wednesday Sept. 3 we headed north from Williamsburg to see Dave's cousin Bob in Amherst, Massachusetts. We arrived on Thursday and spent the next 5 days sightseeing and having a good time with Bob and Linda. 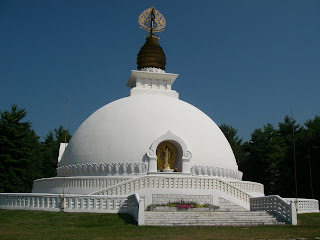 One of the most amazing things in the Amherst area is the Peace Pagoda. It took a long time to build and was built by hand on a large hill that can be seen from all around. It has 4 Buddhas, one on each side, and the site also has two other Buddhist temples (Cambodian and Indian, both in construction). A group of Japanese has constructed these pagodas all around the world with donations and there are two in the U.S.; the other one in the U.S. is in Seattle. While we were at Bob and Linda's, Jack was in fine company. Dusty, Sabrina, and Pico graciously allowed Jack to sleep in all their beds, tear up all their toys, and chase them when they went on a barking spree. He also learned how to use their dog doors and really enjoyed chasing the ball when Bob threw it. 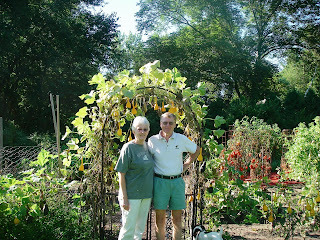 We really enjoyed visiting with Bob and Linda and eating large amounts of fresh vegetables from their overflowing garden. They have super green thumbs and are pictured here with some of their bounty. Tomorrow we stop in at Niagara Falls, then on to Cleveland as we head west to California. That is a nice car color. I like it too. I'm glad Jack found some buddies to play with. Hope you have a good trip home. Thanks Riesa, Jack did suprisingly well with the other dogs. In the past he has not gotten on well with other dogs, but I guess old dogs can learn new tricks! BIG AMAZEMENT RIDE. Congratulations on the super bike tour! Toss that ball from me, for Jack. & Thank you for bringing much inspiration to my summer. Peace to you three on your travels home in the new country. Hey John, Great to hear from you. Are you back on your bike? Please e-mail me at dsmiltz@hotmail.com. LOL I grew up in CT near Hartford and the thought of Buddha's in New England just cracked me up. Hope to meet you in person one of these days I'm visiting Diana and Steve. Hey, you bought my car! Right down to the interior color. 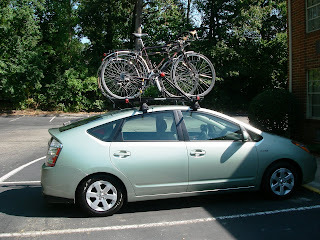 I've been considering buying a recumbent... but in seeing how a standard bike barely fits on the rack, well, maybe a new saddle and shorts are in order. Bill, get that cat pack whipped into a lean mean yowling machine! Yowlzza! Michael, we are looking forward to meeting you! We'll be home sometime around Oct. 1. Hey Joel, say.. I've got a recumbent that will fit on the Prius that I'll make you a deal on! No kidding.. it's a Bike-E, no longer in production but a nice little bike. Check it out out the web, and you can see mine when we get home. "Normal life".. can't remember when ours resembled anything like that! LOL!